Foundation repair is sometimes necessary to prevent your home from susceptibility to leaking, seeping water that results in a wet or flooded basement. When your home was built, the basement was probably waterproofed using a tar or other sealant, and in some cases that sealant will last for the entire life of your home. Often, however, that's not the case. After years of exposure to moisture and soggy soil around the foundation of your home, the moisture barrier of your house may degrade. We are your foundation repair specialists. If you're experiencing pooling water on your basement floor, or small trickles, leaks or even just some occasional dampness, you're in need of a foundation repair. Water that leaks into your home can cause serious problems. In addition to fostering an environment where mold, mildew and fungus spores thrive, a damp basement's concrete will slowly degrade and its drywall and wooden features will bloat and crack. A foundation repair will prevent water from penetrating your basement, improving air quality, preventing crumbling, rotting and rusting, and protecting the value of your home. Water damage has a cumulative effect, meaning that the longer it is left untreated, the more damage it's likely to do. If you have a leaky or wet basement, don't hesitate - give us a call today! There are plenty of reasons that water could be getting into your basement and requiring a foundation repair. Sometimes, the basement sealant that's applied when your home is built wasn't applied properly, and, with a few areas not waterproofed, your basement can begin to leak in a couple of years. Your lawn could be contributing, as well. If you have heavy tree or shrub coverage it's possible that your lawn doesn't get enough sun to effectively evaporate water that's soaked into your soil. This could mean that the soil around your house is far more waterlogged than a normal home's yard, which could be putting excessive pressure on your basement's waterproofing. Additionally, a sloped or graded lawn could be causing runoff precipitation to drain towards your home, again, putting undue pressure on your basement. Regardless of the cause of your basement's mustiness, dampness or pooling water, we're dedicated to finding it and fixing it. Our foundation repair will last and last so that you never have to worry about the problem again. 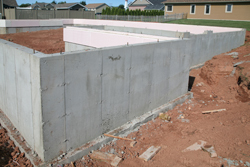 Don't hesitate to get your basement fixed, give us a call today for a quality foundation repair! We can answer all of your foundation repair questions! Water damage is the effects of moisture, dampness, leaks and pooling water on your home. Water damage is a lot more serious than many people think, and can necessitate very expensive repairs including the replacement of structural and cosmetic components of your home. In addition to just getting your things wet and ruining storage space, leaks in your basement can cause warped or swollen wooden components of your home, crumbling or breaking drywall, rusting pipes and metal fixtures, and drastic increase in mold, mildew and fungus spores living in the air and on your walls. Not only does water damage threaten the structural integrity of your home, it threatens your health as well. Mold, mildew and fungus spores create a terrible musty smell, but that's not allThese growths aggravate respiratory conditions like asthma or allergies, and they can cause respiratory tract infections. As you can see, the effects of water damage on your home are far reaching. Between expensive repairs to structural damage, a degradation of air quality and subsequently health, and a loss of usable space it's no question whether you should get a foundation repair. Our service is just the thing, give us a call today!